The History of Tom Thumb was published in 1621, and has the distinction of being the very first fairy tale to be printed in English. In the story, Tom is no bigger than his father's thumb, and that is where he gets his name. 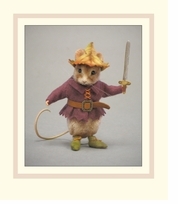 His small size allows him to have many unusual adventures including being swallowed by a cow, tangling with giants, and becoming a favorite of the legendary King Arthur. 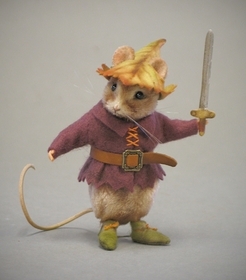 Created for the first time in the form of a mouse, Tom Thumb is made of fine mohair plush with realistic shading, resin hands and feet, German glass eyes, inset whiskers, and a leather tail. Measuring just 3 inches tall, a built-in metal stand provides effortless display. Tom Thumb comes outfitted in a delightful period costume made of custom made all-wool felt. His jaunty cap has been artistically shaded and embossed to appear as if it was constructed from a leaf! His tunic is gathered at the waist with a leather belt fastened with a tiny custom-cast decorative brass buckle. On his feet Tom wears a tiny pair of peasant shoes. In one hand he holds his trusty sword handcrafted at the RJW studio out of wood. No detail has been spared to bring this delightful fairy tale character vividly to life. 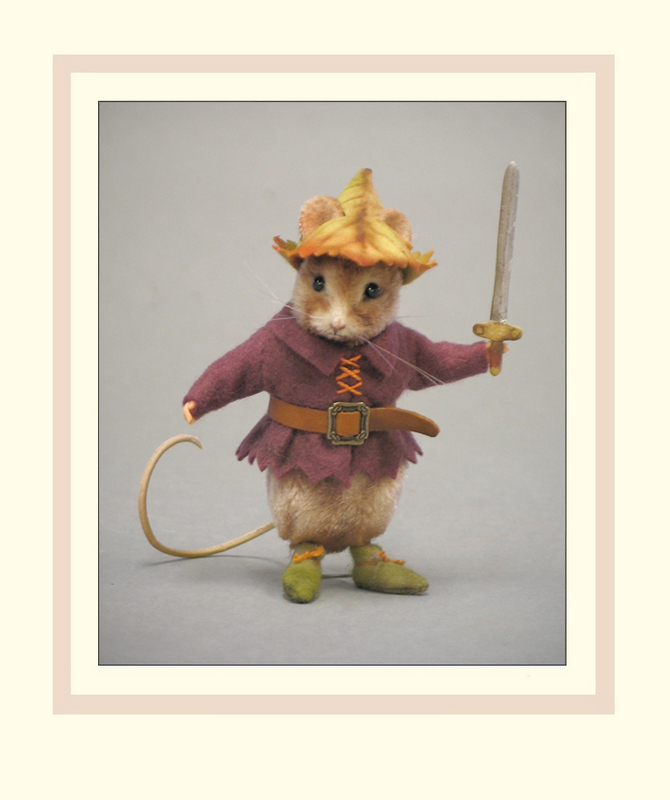 He was the second piece in the R John Wright series of mice from classic children's FAIRY TALES!